Famous people born on AUGUST 20, in general, are delightful with high energy levels. They enjoy a good friendly competition. However, when they lose, they can be something of a challenge themselves. This is a good time when they feel the need to stay at home and curl up with someone special or a good book or movie. Normally, they attract some colorful characters. Maybe they could try a different avenue to meet new people. They have a tendency to be behind times when it comes to dating. And another thing… they need to stop being so negative where love is concerned and not ask so many questions on the first date. This could be a turn off to someone they have just met. On the other hand, famous August 20 celebrities may enjoy the single life. Whoever they decided on mating with, they are likely going to be friends first as they are in no hurry to make a commitment. 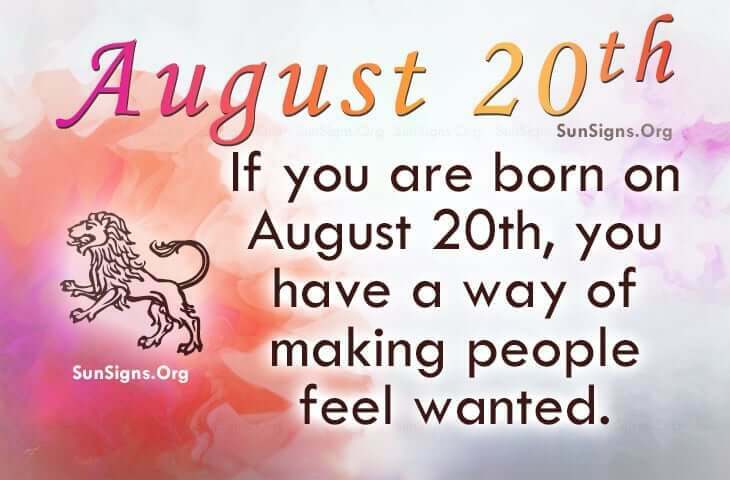 Famous people born on AUGUST 20th are likely to be hard workers. They don’t like drama, lies or deceit. They have a tendency to attract a certain element that could be less than desirable. Although, they are calm people, they have a way of making people feel wanted.